Debut collection of seven intelligent short stories and a novella about Asian-Americans, mostly centered in coastal California, by the editor of Ploughshares. Even at sea in a fishing boat, Lee anchors readers in the minds of his characters, who are deeply immersed in their occupations: piloting, engineering, golfing, making chairs, or even taking up amateur boxing. Yet work is always a vehicle through which the author defines characterizations and reveals emotion. In “The Price of Eggs in China,” two poets—rich, swaddled Marcella Ahn and slobby, struggling Caroline Yip—publish at the same time, get reviewed in tandem, and then fade. Six years later, Caroline takes up with Dean Kaneshiro, an artist who hand-sculpts chairs (bought by the White House), but then finds her life again invaded by Marcella, who wants Dean for herself. “Widowers” limns two different responses to loss. Charter boat captain Alan Fujitani, whose wife died 20 years ago, takes a 22-year-old woman out to sea to dump her despised husband’s ashes into the waves. They later strike up a wavering affair, though Alan is still heartbroken, haunted daily by memories of his dead spouse. 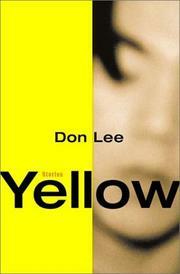 Lee’s most ambitious piece here is the novella, “Yellow,” which gets under the skin of Korean Danny Kim. A dashingly athletic and handsome student who beds but fails to stick with several white girls, he finally marries a Korean chosen by his mother. His wife is the first Asian woman he ‘s ever slept with, and the marriage nearly dies under the pressure of his supremely disciplined climb toward a partnership in a Boston engineering firm. Danny’s response to race prejudice is to attempt to rise above his skin. His story has an absolutely wonderful twist impossible to foresee, and it demonstrates Lee’s strength in a longer form. Memorable. May the author now fearlessly face a novel.